Ribbons of fresh tagliatelle noodles with Bolognese sauce! This is a re-post from October, 2014, four years ago while my mother was still alive and whirling around in my kitchen with me. Because my blog is primarily for journaling life on a country acreage, in the kitchen, in the gardens, and on the road . . . to maintain the integrity of the blog, I simply wanted to re-share this autumnal recipe and tablescape that I had posted from the past . . . yet keep it in its original presentation. For the Bolognese Sauce that I prepared with my mother over the weekend, a fresh batch of pasta was also made to go along with the sauce. The pasta shape that we chose was tagliatelle, the traditional pasta from Bologna and the Emilia-Romagna and Marche regions of Italy. Tagliatelle are long, flat ribbons of pasta, very much similar in shape to fettuccine and is classically served with Bolognese sauce. When freshly rolled out, the texture is a little bit less smooth than what you get with a packaged, dry pasta. But this porous texture is exactly what makes it perfect for thicker sauces made from beef, pork or veal. OK, OK, OK, I know what you’re thinking when you look at the photo above with the amount of sauce dolloped on the top of the pasta (that had already been gently mixed with the sauce). I do know that when in Italy, only a little bit of sauce is blended into pasta. But I also know that my husband is crazy-nuts about this sauce and always wants more, more and MORE sauce on his pasta. What can I say? He’s a typical American who just wants more sauce. And that’s what I like . . . happy people around my table. So before you might think that I don’t know how to properly serve pasta with sauce in the authentic Italian way, I assure that I know how to toss it all together correctly, but that first and foremost, I’m more concerned about a happy tummy for my husband . . . and truthfully for anyone who wants it served this way. ’nuff said. The correct amount of sauce the way it is preferred in Italy. After you make your pasta (here’s a link to my family’s recipe), get ready to ROLL!!! Here is a step-by-step photo presentation of my mother working a fresh batch of pasta into some beautiful noodle shapes . . . this time for Tagliatelle! Place pasta through the pasta machine starting with a thick piece first and with each press, decrease the # of thickness on the machine to a smaller number, here we went to #3 (in the bottom photo). After using the first flat pasta sheet rollers, you then remove that attachment (if using a Kitchen-Aid) and place the noodle attachment on your machine . . . pre-selecting what shape of noodle you want to make. We selected the ‘tagliatelle’ pasta shape (flat and somewhat wide . . . not as thin as spaghetti or linguine, yet not as wide as fettucini) for this pasta dish. With the electric Kitchen Aid pasta attachments, it takes only a few minutes at the most to produce fresh pasta . . . word of warning! HAVE A DEEP POT OF WATER BOILING, SALTED and READY for this fresh pasta to be put in the water. It only takes another 3 minutes maximum for perfect ‘al dente’ cooked pasta. Obviously, you must have your sauce hot as well, and ready to just plop in the pasta upon it’s brief swim in the hot boiling water! Beautiful fresh strips of pasta! And now for a tablescape for your fall entertaining! This is how I decorate my kitchen table with an autumnal feel. I use the SAME decorations every year, but sometimes if something lovely strikes me, I’ll pick it up and add it to my annual tablescapes. The only things that have been added this year to this autumn tablescape are the round woven wicker ‘placemats’ and the wooden green painted chargers under the plates. You can see how I use these in the spring and how I keep the same natural and green theme of my home in this tablescape from spring to autumn. These foundational colors carry into the Christmas holiday too and all I do is add more reds and/or pinks to the color scheme . . . see where I’m going with this? Spend wisely on nice things . . . and then save and store them carefully . . . using them over and over again . . . adding a few new things when you like . . . and always reuse and recycle! This always leaves you with such a good feeling inside while enjoying an visually beautiful aesthetic in your home! These are the wonderful things that add continuity in your family customs and that can be passed down in your family if carefully tended to and stored! You will be remembered throughout the years at your family’s table, I guarantee it! Our acreage is located in the woods way out in the country and so I incorporate a lot of natural colors to blend with our surroundings. Lots of various earthy shades of green are the primary color which I carry through all of my decorating, even as the seasons change. 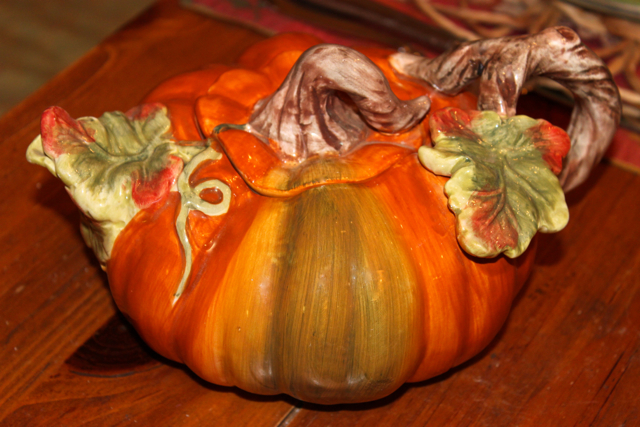 An old, treasured ceramic pumpkin-shaped teapot to accent the table! 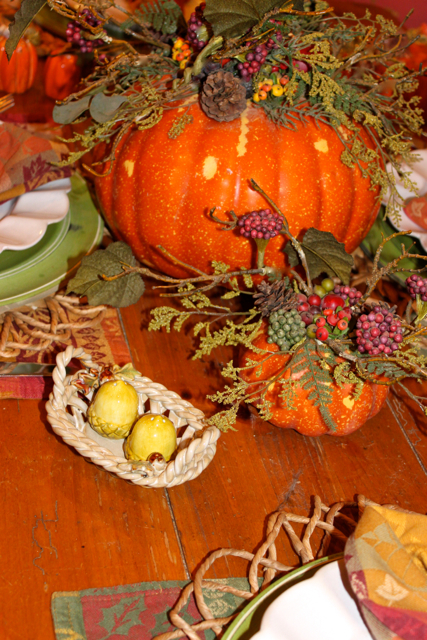 Pumpkin with autumn fruit and foliage-themed focal point of the tablescape. 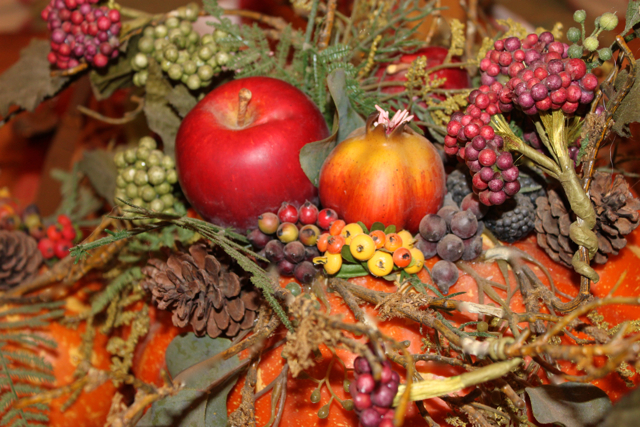 Beautiful autumn colors in the centerpiece of 3 different-sized artificial (re-usable) pumpkins! I love the little acorn salt and pepper shakers in the ceramic basket! 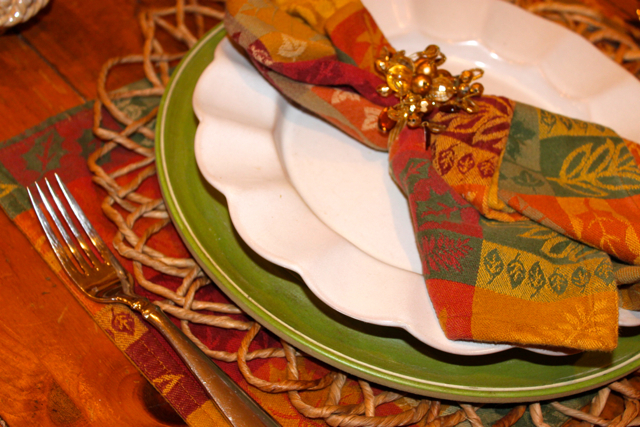 I re-used the woven wicker placemats and wooden green-painted chargers from my spring tablescape and placed them on top of old re-used placemats with old matching napkins. I hope that you have a beautiful and delicious autumn season!!! Love this sauce … I am of the less sauce more cheese persuasion … and like some of the meaty sauce on the side (with a crust of bread) … Making pasta is so much fun isn’t it? Especially when Mom helps and shows some of her tricks! Miss seeing you around the Supper Club! Susan, I like it the way that you do too . . . and with that said, I like it any way! Miss you too, but my job has taken over my life it seems! Homemade pasta with Bolognese…life couldn’t be better, Roz. Life is pretty good, as you said Angie, with fresh homemade pasta and some comfort food-homemade sauce to top it off with! Beautiful autumnal colours! Your pasta looks fantastic! Just the kind of comforting dish that I fancy on an autumn evening! Thanks Beth . . . I just visited your blog and love the mushroom pasta recipe that you shared! Hope to read more of your recipes in the future! You will never hear me say that you don’t know how to properly serve pasta with sauce in the authentic Italian way. Ever. 🙂 I have no doubt that you know exactly what you’re doing. I have a pasta maker and have used it exactly once. Thanks for the inspiration to get that thing out and give it another try. My mom made her own noodles all the time, so don’t know why I don’t take the time. Your table is beautiful Roz. And the only thing missing is a happy group of people to enjoy that inviting setting and your delicious food. Lea Ann, I am sure that when you get that pasta machine out, that you’ll crank out some really awesome noodles! It all looks absolutely luscious! You’re encouraging me to break out the pasta maker! I love making pasta, and this new gadget is a life saver in terms of time! No guilt either! What a beautiful tablescape Roz! So inviting as is your pasta! Thank you Anne! You’re always so kind! Great looking meal Roz as is the table. During our one visit to Italy the question we asked ourselves when the pasta arrived was “where’s the sauce?’ Bev likes hers just like your hubby and I’m nearer to him than Italy, especially with meat sauce. You’ve sure made me crave pasta with these last posts. We love our sauce laden on thick just like you Larry! I think that people should have any meal prepared any way that they like (especially if they pay for it in a restaurant and also when made in the privacy of their homes)! Hope you’re all doing well! Lovely table…and the pasta looks delicious! Thank you so much Kate! I always love your kind comments! You ‘re so cute Roz, about putting tons of sauce on the pasta. We do the exact same thing, since Bolognese sauce is our favorite sauce; we like the pasta smothered in sauce, more like we are eating sauce with the pasta, rather than pasta with sauce…LOL…. What’s that old saying, “Great minds think alike”? In this case ABSOLUTELY! Pour on the sauce! Roz – It’s your husband so you’re allowed to serve it to him just the way he likes it – and why wouldn’t he want extra with a sauce this delicious? Oh Linda, you’re just the best! Roz, Your table is so beautiful! One of my favorite things to do is decorate the table for holidays. Yours is one of the prettiest I’ve ever seen. I love the green chargers and how they look combined with the wicker behind them. And all of the foliage combined with the pumpkins is stunning. Your husband is very blessed that you care so much about his preferences. You are a great example to all of us. Thank you for sharing with us. Decorating is just so much fun, Shari! Thanks for your compliments! I want it all (and will have it all). The Bolognese is perfect and I always make double – both husband and kids do like it saucy and so they get it saucy! The table is just an autumn song. What a lovely smile you gave me for this November morning. As I’ve always said and believe, you write like a poet! I love reading anything that you write, even if it is a simple comment! beautiful!!!! pasta machine is very useful!!! godd receipe!!! Grazie Annalisa! Your expertise in Italian cucina is outstanding and I respect your kind comment and opinion! i can;t believe you made your own noodles! You are the bomb my friend! The bomb and that sauce sounds fantastic. out of this world! Well any pasta that you make would be heavenly, Jessica! Liz, just say the word and I’ll be so happy to show you how! Easy, peezy once you get going! I so admire people that can make such beautiful pasta! I’ve made it once in my life and it wasn’t near as easy to do as you make it look. There is nothing better than fresh pasts with bolognese. Thanks for this post! Oh you are so welcome and just know that I truly appreciate each and every time that you stop by! Beautiful table arrangement. There is nothing quite so good as homemade pasta. Your dish looks delicious. Grazie mille, mi amica Jovina! Oh Roz, this is just lovely. How grand that you and your mom work beside one another in your kitchen. I find it heartwarming, and it is an utter pleasure to read about it. Your food looks delicious – and I say if you want your past and sauce certain way, then have it that way. It’s your dinner, after all! Thank you for a delicious post! Oh your comment means so much to me, Adri! Grazie! Homemade pasta! The best kind ever…and the sauce…to die for. I agree Lail and I hope you try it! Let me know what you think! I have been toying with the idea of using my Kitchen Aid to make pasta, but now I’m sold. In fact, I can’t wait to try it. Your table and the lovely pieces on it are a visual feast, absolutely beautiful. Let me know what you think Maureen, I certainly have nothing to gain from this post. Totally just sharing my experience. No commission, but it would have been nice, huh? Pasta homemade is lovely! It’s tipical of italian people make tagliatelle with ragu’!!! see you! I’m so glad that I was able to keep this as traditional as possible Annalisa! Your table is beautiful but I’d line up outside for a plate of that pasta. I’m with your husband – more sauce! As it is said, Maureen, ‘great minds (and probably tummies and tastebuds) think alike! I am hoping to enjoy this recipe when my husband and I eat in Bologna, Italy this coming May, Ilaria. Do you have any recommendations on where a good ‘Bolognese’ is served? How crafty of you! How insanely creative of you! You made pasta from the scratch in your kitchen! That is some gutsy culinary move, I’d say! Hats off, Your Excellency! Oh thank you so much! Once you’ve done this a few times, it is super easy! Thanks for stopping by! I haven’t even finished my first cup of coffee and I’m ready for a plate of your beautiful homemade pasta and sauce. OMG…that looks so good. Gorgeous table, Roz. You are so sweet, Cathy! 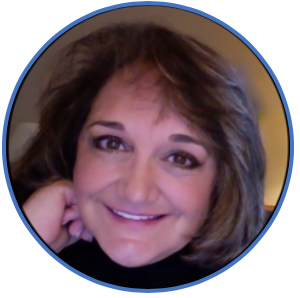 I can’t thank you enough for being my blogging friend! I love Bolognese sauce and would want an extra serving of it on my pasta, too, Roz! 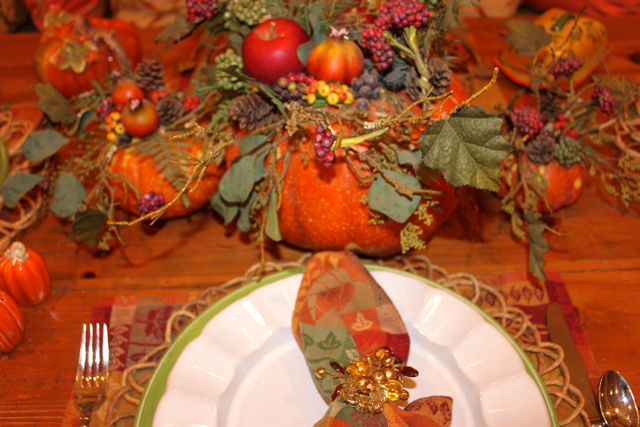 Your autumn table is decorated beautifully! Thank you Pat! So nice of you to always stop by and say hello! Yes, Betty, you’re right! It is so important and special to have photos of our loved ones who have passed. Thank you so much for your kind comment! I was looking for your recipe of the bolognese sauce but its no longer on your blog! Can you, please, please, repost it?